Since 1977, Redi-Mark has held a special place in the hearts of its customers, offering a variety of custom services. Whether you need plaques or trophies engraved, rubber stamp creations, laminations or something else, residents in Manteca, CA know Redi-Mark is the place to go! 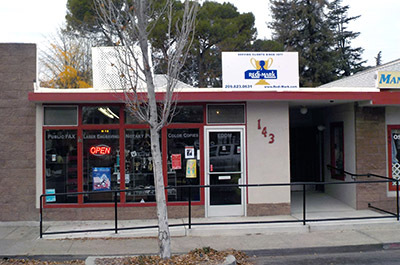 There’s no other trophy shop in Manteca, CA much like Redi-Mark. We’ve been serving Manteca and its surrounding area for more than 38 years and we have no plans of slowing down. Our establishment is family-owned and –operated, with a strong work ethic etched into its roots. If there is any service you need, from creating custom-made trophies to eye-popping office supplies, we’ve got you covered. We are more than just a trophy shop! Here at Redi-Mark we will do the best we can to make you feel like you’re receiving the best service Manteca, CA has ever seen. Our goal is to keep you coming back. We are family-owned and -operated, in business since 1977. We provide custom awards and services nationwide. We offer notary public services. We serve surrounding areas such as Modesto, Stockton and San Joaquin County, CA. We promise to take care of you when you work with Redi-Mark! Stop in, call or email us with any questions or for a quote on services. You won’t be sorry you chose us! the surrounding areas, and shipping products across the nation!